Heat the oven to 350°F. 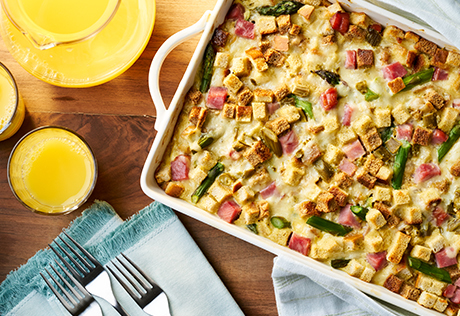 Stir the stuffing, cheese, asparagus and ham in a greased 3-quart shallow baking dish. Beat the soup, milk, eggs and mustard in a medium bowl with a fork or whisk. Pour over the stuffing mixture. Stir and press the stuffing mixture into the milk mixture to coat. For 1 1/2 cups cooked cut asparagus use 3/4 pound fresh asparagus, trimmed and cut into 1-inch pieces or 1 package (about 10 ounces) frozen asparagus spears, thawed, drained and cut into 1-inch pieces.